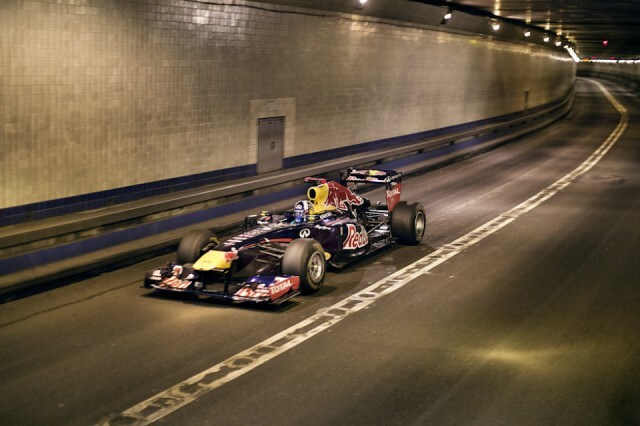 An F1 race car hurtles through the Lincoln Tunnel at 190 MPH in this clip from Red Bull Racing. Driver David Coulthard performed the 30 second “commute” earlier this month in New York City as part of Red Bull Racing’s American Vacation 2 tour. Red Bull Racing hopes to compete in a proposed 2013 Grand Prix of America race that would take place on the streets of Weehawken and West New York, New Jersey, within sight of Manhattan’s skyline.